A fake fire creates a visual effect of flickering flames and fire colors. Fake fires work as campfire props and stage settings, and make an effective focal point for a faux fireplace. The advantages of a fake fire include the lack of fire risk, keeping the fireplace and air clean and free of smoke and carbon, and the opportunity to add a dynamic, three-dimensional decorative feature to the room. Customize the fake fire to suit your faux fireplace and make your own conversation piece. Give your faux fireplace the ambiance of a crackling fire with a few basic supplies. Create a fake fire with cellophane and a fan. Measure the faux fireplace. Plan to make flames at least half the height of the fireplace opening. Stand back and decide how wide and high you want to make the fake fire to make it look real. For example, if the distance from the fireplace floor to the top of the fireplace opening is 30 inches, make the fake fire 15 inches tall. Make the fire at least half the width of the fireplace opening. 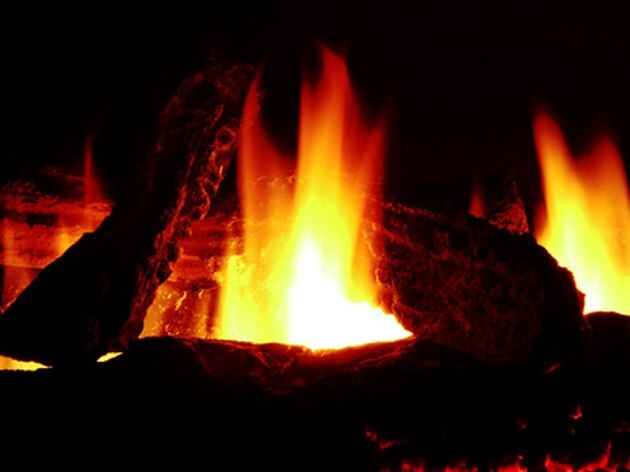 Buy small logs or split logs the length you chose for the width of the fire in step 1. Set a mirror against the back wall of the faux fireplace, if desired. This will increase the light effect and sense of motion of the fire. Draw flame shapes on the cellophane with a felt pen. Make the flame shapes different heights, with one flame in each color reaching to the height you selected in step 1. Creating different heights and shapes in the flames creates a realistic effect. Make the flames wide at the bottom and pointed at the top. Cut the cellophane into the flame shapes. Stack the fireplace logs to look like a real fire in proportion to the faux fireplace. Leave a space in the middle of the logs for the fan. Place the fan on the fireplace floor, aiming upward. A small fan designed for a computer or from an electronics supply store, or a small battery-powered fan with rechargeable batteries works best. Glue the bases of the flames to the fireplace logs, alternating colors. Let the flames dry for at least 20 minutes. Place a flickering faux candle in the middle of the fireplace logs and turn it on. Turn on the fan.